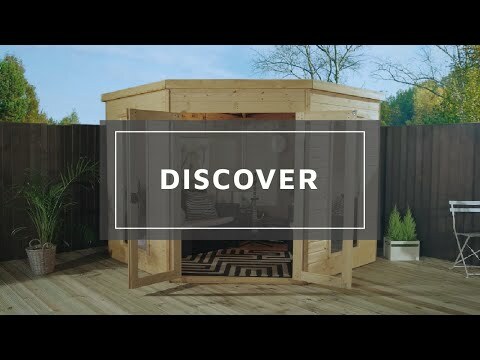 The 7ft x 7ft Corner Premier Summer House is made from high quality, 12mm shiplap tongue and groove cladding to provide a strong garden building that is built to last. The Corner Premier Summer House is features 27mm x 32mm framing and has a roof and floor made from tongue and grooved timber panels. This building offers a panoramic view of your garden with its full length glazed frontage and side windows that also flood the building with light. Double doors ensure easy and comfortable access to the Corner Premier Summer House and can be used to regulate the temperature in the room as well. Your summer house's roof will be protected from rain water damage by a hardwearing roll of mineral roofing felt. Review:I cannot even view the item as it is pushed in between stock from my previous location and my way in, is completely blocked. It is not possible to view it is sideways pushed in I am hoping it is in good condition when it is removed on Thursday. It is great that you are happy with the quality of your summerhouse and I am sure that once erected, you will have many happy years of use from it. I am pleased to know that you are happy with the value for money of your summerhouse and I am sure you will have many happy years of use from it. Thank you again for your great review! Review:Looks good ,fairly easy to erect, though not by me! Review:Could have got this product considerably cheaper by shopping around. Not worth upgrading to the premium model the difference in price isn't refleted in the extras. Review:Lovely product. Although one of styrene windows slightly warped....And maybe printed instructions possibly require checking e.g.. about 4 step 5's......Paid for premium model but found T&G flooring slightly flimsy, so re faced with ply now solid as.....But aside, absolutely love it. Thank you Waltons. 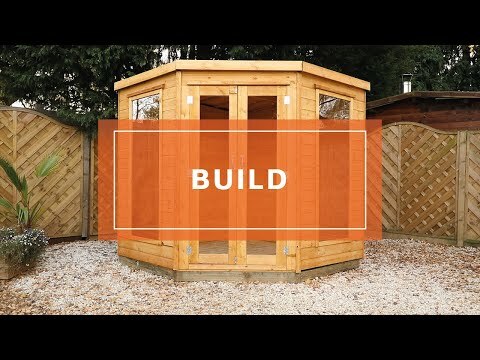 Review:I would recomend this summerhouse as the construction allows the assembly to fit together easily . I am delighted to know that you are happy with the the quality of your summerhouse and that assembly was straight forward. Thank you again for your review! I am thrilled that you found your summerhouse to be good value for money and that it makes a perfect addition to your garden. Thank you for the photo - it looks lovely! Thank you again for your great review! Apologies for the issue with the deciphering of parts and we take all of your comments on board as we are always looking for ways to make improvements. I am thrilled that you are happy overall and thank you for the image - it looks beautiful. I am glad you found the service to be good start to finish and thank you again for your review! Our Reply:I am pleased that you are happy with your summerhouse and I am sure you will have many happy years of use from it. Thank you again for your positive review! Review:The finish although good could have been a little better for a premier title.Minor details but important to warrant the price and title eg joints miss nailed causing splits. Our Reply:I am glad that you are pleased with your new tongue and groove summerhouse and we will take all of your comments on board as we are always looking for ways to improve. Thank you for your honest feedback! Review:Think this is excellent value for money and will be great when I finish painting it. Having it installed was a real bonus as I suffer from a bad back. This product is exactly as advertised and am very pleased with it. Our Reply:I am so pleased to know that you are happy with the value for money of your summerhouse and you are happy with the quality. Thank you again for your kind feedback.